The yearning for travel and an unrestricted lifestyle has always been encoded in my DNA. Maybe it is the fact my parents emigrated to America when I was just two. Twice in college I backpacked my way through Europe with barely two nickels to rub together. I was so broke that I spent every other night on a train to keep my lodging costs down. In college, I remember someone telling me about all the Americans moving down to Costa Rica to retire to paradise on a budget. I daydreamed of retiring at a young age to the Costa Rican paradise; beaches and rainforests and the laid back life! After months of planning and two long days of Caterpalooza, I treated myself to a trip to Costa Rica. This country operates on island time. Yes, I know it’s not an island but with the Caribbean on the eastern coast and the Pacific on the western coast, it is definitely the island vibe. We stayed in Playa Hermosa, a sleepy little beach town with a handful of restaurants and one small grocery store. Massages on the beach, monkeys in the trees and the best frozen mojitos, ceviche and fish tacos at Aqua Sport was my routine. Costa Rica is known for its surfing. I decided to take lessons. My goal was just to ride a single wave. Funny thing was that walking across piping hot sand in bare feet was the toughest part of the day. Oh did I mention the wind whipped my surfboard out of the water and smacked me square in my left ear? It threw me for a loop, but I refused to quit. 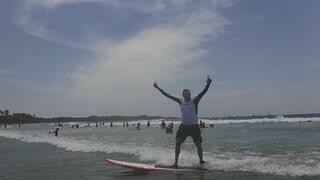 So what does surfing have to do with boosting your catering business? I know it may seem farfetched, but please follow. We are all guilty of falling into the same routine. You wake up, you get to work, you come home and go to bed. I know many of you have hobbies or do more than I have outlined, but when was the last time you did something outside your comfort zone? In surfing you must be on the lookout for the perfect wave. In business you are on the lookout for business opportunities. Like surfing, you must decide which ones to pursue and which ones to pass on. Getting up on the board is akin to committing to action. You can’t half commit to a wave. In business you can’t half commit to an idea or initiative. You’d be shocked how many people I talk to each week with a desire to build a large catering business like I did, but can’t commit any time or financial resources to the pursuit. I have yet to start or run a business that did not require action. The more action I took, the more successful I became. Now riding the wave is symbolic to the commitment you must have in business. Once you find that perfect wave or catering marketing initiative, hold on and ride it to the shore (of profits). And once you ride the wave to completion, relish in your accomplishment and go back and find another one to own! So whether you adopt my practical lessons of surfing or choose to stretch outside of your comfort zone, there is true value in pushing your boundaries. Even if you can’t afford to hop a plane to Costa Rica this weekend, what can you do in your backyard that’s different than your daily grind? Go to the symphony, picnic in the park, go hiking, biking or visit a museum. Heck! Go find a place to sit down and do some people watching, which in Nashville is Opry Mills Mall. That’ll keep you entertained! Hopefully, we will see you at Caterpalooza 2017!